We often hear about the high percentage of new businesses that fail, but imagine a world in which it’s easier to grow your business than you thought. Imagine a world in which just 10 simple steps could help you take your business to the next level – starting today. Thanks to Dave Kerpen, CEO of Likeable Local and Cofounder & Chairman of Likeable Media, you don’t have to imagine. You can learn how to build your business today. Dave has 10 proven business strategies that have brought him massive success over the last seven years, and he recently shared these insights with Chad Cooper in a Tony Robbins webinar. Take a look at Kerpen’s 10 key strategies and learn how to build a 10 million dollar business. Whether it’s a close friend or family member, partner with people you know you can trust as you begin researching how to build a business. Most of the time, we focus on the character and virtues of those we are legally partnered with. But vetting other people and entities that you are associated with – including your vendors and advisors – is equally critical. You have the freedom to select whom you want to work with, so take the time to do your research. One of the biggest mistakes young businesses make is over-committing. In their pursuit to build a million dollar business, they end up saying yes to almost everything because they’re excited to get the word out about their company, but they often lack a clear focus by not being selective enough. But if you try to be all things to all people, chances are you will fail. Start with making a one-page strategic plan that forces you to focus on creating and doing one thing for one target audience. What do you want to do that will add value to the lives of your customers? Verne Harnish’s one-pager provides an ideal framework to help structure this thought process. With a singular focus, you can harness all of your energy and effort and direct it toward a specific outcome. Saying no to anything that isn’t in your direct line of fire may be difficult to do at first, but can actually be one of the smartest business decisions you make in the long run – even if it means firing your own customers. Why? Because it frees you up to focus on your target, it allows for more space and bandwidth to grow, and makes you available for the yesses. How does learning to set limits help you excel in knowing how to build a business? The answer is twofold, hinging on the equation of time management coupled with the emotional toll of over-committing yourself (and your team) in the pursuit of business success. The former needs little explanation; there are only 24 hours in a day, and you and your team can only accomplish so much during the eight or so hours in the workday. Meanwhile, to understand the role of emotional boundaries in building a million-dollar business, let’s look at the research. Research demonstrates that as much as 80% of workplace difficulties boil down to strained workplace relationships. Leadership consultants observed that even the most talented and driven business owners and employees tend to become derailed by poorly-managed workplace dynamics. Consultants recommend several practical strategies for putting parameters around your time and interactions as you work to build your business. In addition to practicing effective time management, be sure to express your professional boundaries clearly (i.e. what you and your team can and will do in any given day or week); stay clear on what your role actually is (instead of taking on other people’s jobs) and learn to recognize and address workplace toxicity when it happens (don’t let poor boundaries linger in the workplace). As you practice these skills and make them a known part of your company culture, your staff, partners and customers will all benefit, thus helping you create the million dollar business you set out to create when you launched your business. If you’re a business owner, you know what’s at stake and how much risk is involved in running a company. But how do you handle the fear of failure? Where do you go for advice and guidance in learning how to build your business? You want to uphold your position as a leader and don’t want to talk about these things with your team, and you might not want to discuss these heavy topics with your family. That’s why finding a peer community is so important. Not only can this provide a confidential atmosphere where you can find support and valuable insight, but it can be instrumental in the process of learning the most efficient and effective ways of taking your business to the next level. A critical component in learning how to build a business is coordinating a group of trusted mentors to counsel you on key issues in growing your business. Many of these people know how to make a million dollar business and can advise you on your financial plan. While an advisory board may not seem like a critical component of business success, it can actually become one of your most important assets in business development – providing the strategic advice and complementary skills to take your company to the next level. As you work to build your business, you’ll quickly learn that the sooner you part ways with employees who aren’t the right fit, the better. Most of us, however, do the opposite. We hire quickly to fill the position when we really should be taking our time to determine if the candidate has the right nature, the right personality and whether or not their core values align with the company’s mission. Then we are slow to let the person go, even though we know in our gut that it isn’t working. By hiring slow and firing fast, you will find that it is more efficient and effective for you, your business and for that person. This approach makes it more likely that you’ll bring valuable team players on who will help your company grow. Additionally, when you hire the right people, you don’t face as much turnover and have to hire and fire less frequently. Learning how to build a business requires creating a welcoming company culture. Take the time to create a space where your employees want to spend their time. Think about it – you spend more of your waking hours at work and with fellow employees than anywhere or with anyone else. So isn’t it worth taking the time and money to create a place that people enjoy working? What is the culture at your company? Do you have a strong set of core values and do your employees value these standards? Building a company where people want to go to work is one of the most pivotal ways to building a growing and sustaining company. What’s more, you want your employees to feel valued at the office. Foster a culture that celebrates your team’s wins, big and small. With social media and a global audience at your fingertips, this is the single best time to build your business by building a brand online. It wasn’t that long ago that you needed to hire a PR agency to create brand identity and awareness. But now, if you are determined and diligent enough, you can build a brand by creating quality content every single day and leveraging social media outlets to attract and engage your target audience. In deciding how to build a business, you’ll find that the best form of marketing is through your current customers. While this may seem obvious, most businesses just don’t utilize this resource. We may feel uncomfortable asking existing customers for referrals or we may not realize how powerful a marketing asset this can be. But if you don’t try you won’t reap the benefits. And it’s actually quite simple to do, if you know how to present your products or services with certainty, and can go a long way toward building your business. How does creating a raving fan base help you build your business? Look at the statistics. Selling to new customers costs about three times more money (and potentially more than that) than it costs to sell to existing customers. While acquiring new customers is certainly essential for growing your business and securing customer loyalty for the long-term, it would be foolish not to cash in on the resource you already have in your existing customer base. Business strategists, therefore, recommend doing everything you possibly can to retain existing customers, who are likely to market your product to their friends. As you build your business, create a product that sells itself, and be sure to incentivize customer loyalty. The single most important factor in your success is your people – your partner, your advisors, your staff, your peers. All of these individuals will help you do the work to build your business. That means you don’t have to do it alone, but you do have to find the right people, and empower them, so you can harness the power and potential of their talent, skill and drive. Looking for additional business strategies to help your company thrive in any economic climate? 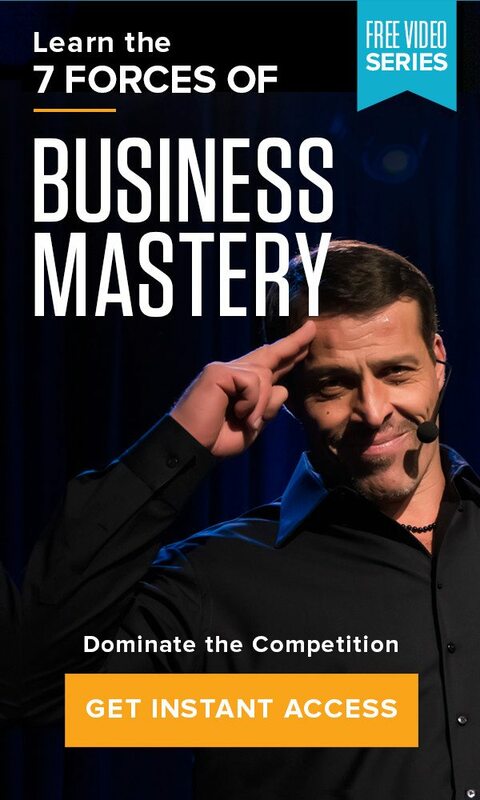 Attend Business Mastery. The incredible five-day event features world-class speakers that will leave you feeling empowered and ready to take on any business challenges. After leaving the event, you’ll be armed with the knowledge you need to make a $10 million business. Are you unhappy at work? Get a personalized assessment of your business and map out your massive action plan with a Tony Robbins Business Strategist (a $600 value! ).